1CLICK DVD COPY is very simple to use. To copy a DVD, click the "START" button. You can configure your software by clicking on the "Options" button. There are hints (popup captions) available for some options, which you will see when you hover the mouse over the check box or title. You will also find several other options in the popup menu, which you can access by clicking the right mouse button anywhere on the application. Note: You can open this user guide by clicking "?" (help) button or by clicking the F1 keyboard key. The default settings will allow you to copy a "Movie Only" DVD (no extras for the best video quality) with English language audio. You can modify these default settings in the Options dialog. Audio: Use this option to select one language as your preferred audio language. In cases where the language you've chosen is not available, it will copy using the default audio language on the DVD. Source: Use this option to select the DVD reader or hard drive folder that contains the movie files. The software will attempt to choose your DVD reader at start up but if you have more than one, you may need to change this setting. Extras or Episodes: Enable this option to include "Extras" (directors cuts and special features) or copy an "Episode DVD" (a television program on DVD). Episode DVDs are usually detected automatically by the software but in some cases you may need to enable this option manually. When this option is disabled (recommended setting), you will get a "Movie Only" copy (no extras), which has the highest possible video quality. We recommend you disable this option and only enable it for episode DVDs. This option is disabled by default. All Languages: Enable this option to include all available audio languages on your copy. This option will require considerably more space on the disc and will lower the quality of the video on some movies. The option is disabled by default. DTS Audio: Enable this option to copy the "DTS" audio (a high definition audio format similar to Dolby Digital). This option will require considerably more space on the disc and will lower the quality of the video on some movies. This option is disabled by default. Movie Menus: Enable this option if you want a menu on a "Movie Only" ('Include Extras' disabled) copy. Keeping menus without Including Extras may cause some menu options to function incorrectly. We recommend you disable this feature to increase playback compatibility on your DVD player. This options is disabled by default. Dual Layer: This option is disabled (unchecked) by default. When enabled, it permits you to copy and burn dual layer "DVD-9" DVDs directly to a dual layered media. In cases where the original DVD exceeds the maximum size of a dual layer recordable disc (8.5GB), 1Click DVD Copy will compress the video to ensure the movie fits the disc. If you do not have dual layered recordable media, this option should be disabled. Toggle Log Window visibility: Show or hide the log file window for the current copy session. The log file contains information about copy settings and DVD burning. NOTE: You can also open the entire log file (including previous copy sessions) using the F8 keyboard key. This will open the entire log file ("1click.log") in Windows Notepad. This is helpful if you want to quickly locate and save the log file to send to support in an email attachment. It is important that you include this log file with your email correspondence when requesting support. Enable update notification: Launch an internet browser window to the website download page when a new version of the software becomes available for download. We strongly recommend you leave this option enabled to ensure you will be notified of new updates. Enable media Stats collection - VSO: 1CLICK DVD COPY uses a writing engine (for burning DVDs) which is licensed from VSO Software. VSO uses an online reporting system to gather information about DVD writers and blank media to improve the writing engine. This information will also help you to choose the best media for your DVD writer. This feature is enabled by default and will send DVD media statistics via internet each time a DVD is burned. You can disable this feature by un-checking the check box. Save "Episodes or Extras" option setting: This feature is disabled by default. Normally option settings are saved between copy sessions. 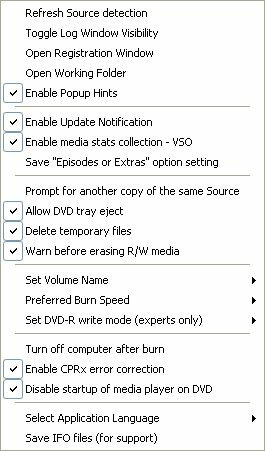 However, if you always do "Movie Only" copies and you only enable the "Episodes or Extras" option when copying an episode DVD, then you probably won't want to save this setting between copy sessions. However, if you always copy movies with extras, then you may wish to enable this setting to save the "Episodes or Extras" setting between sessions. Prompt for another copy of the same Source: Enable this option if you want to receive a prompt after the DVD is burned to burn a second DVD of the same copied movie. Allow DVD tray eject: This option is enabled by default. If you don't want the DVD reader/writer tray to eject the DVD when required, you must disable this option. Set volume name: Use this option to manually enter the volume name of the DVD before it's burned. By default, the program will use the volume name on the original DVD. In some cases however, the volume name may be inadequate to properly identify the name of the movie. Once you click on this option, you'll see a text box labeled "Volume Name" where you can enter the name you prefer. Remember to press the "Enter" key when you have finished entering the volume name. Use high quality recordable DVD media. Media that costs half the price of good media can fail as often as 50% of the time. Always refer to the DVD writer manufacture for the list of recommended media for your DVD writer. If you encounter problems copying or burning a DVD, please refer to our online FAQ page. You may also contact us directly for support using our Support link.